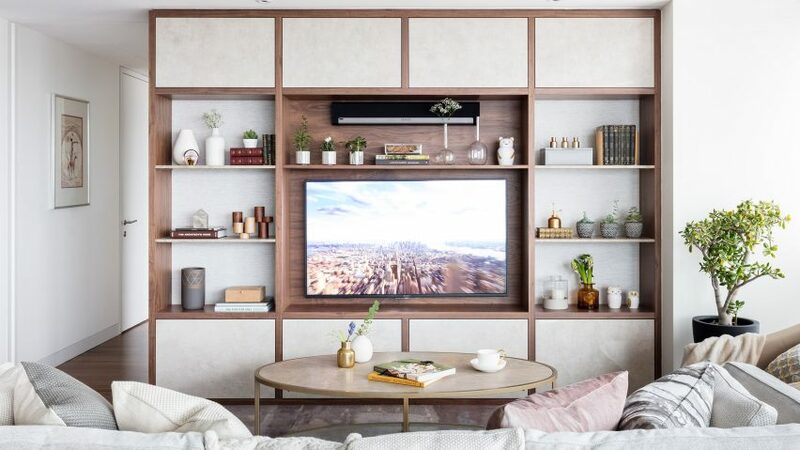 British interiors studio Black & Milk has redesigned an apartment for a city trader in Canaletto Tower, a luxury residential skyscraper designed by UNStudio on London's City Road. Black & Milk's client asked the firm to create an interior with "a hint of understated luxury". 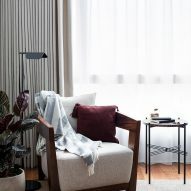 In response, the studio redesigned the apartment's open-plan living room to accommodate a formal dining area, a kitchen and a generous lounge area in which the client could host friends. "The original layout of the space with the rectangular kitchen island in the middle of the room did not allow for a large sofa and proper dining area," said the studio. "We had to take the island away and completely change the location of the zones." A new triangular kitchen island was designed to create a breakfast bar area and to provide enough work surface for cooking. The addition of the island also helped to "visually correct the awkward shape of the room," say the designers. 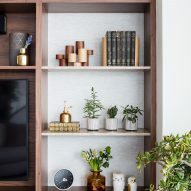 A clean-lined storage and entertainment unit with marble shelves was added to the space to display the client's personal trophies. A bespoke coffee table designed by London-based furniture designer Tom Faulkner features a marble top that matches the marble used on the storage unit shelves. "The client wanted a neutral and calm colour scheme without any particular accent patterns," explained the designers. "In order to create dynamic and saturated space we used a lot of rich textures and different finishes, but still staying within the safe colour palette." In the bedroom, a chocolate-coloured, upholstered headboard is contrasted by natural linen wallpaper. Lighting designed by London-based designer Michael Anastassiades for Flos is used in the bedroom and living room. The study was highlighted by the client as an important space, which should have room to accommodate a table for two to three large monitors as well as enough space for folders and books. A corner for reading and relaxing was added to the space to encourage a change of routine during long working hours. Designed by Amsterdam-based architecture firm UNStudio, Canaletto Tower is 31-storey luxury residential skyscraper completed in 2016. The tower is designed with a curving facade of metal and glass that breaks the volume into a series of three-to-five-storey clusters. Each of these clusters are imagined as individual "neighbourhoods in the sky", with balcony terraces that afford views of the City of London to the south and the basin waterways to the north.